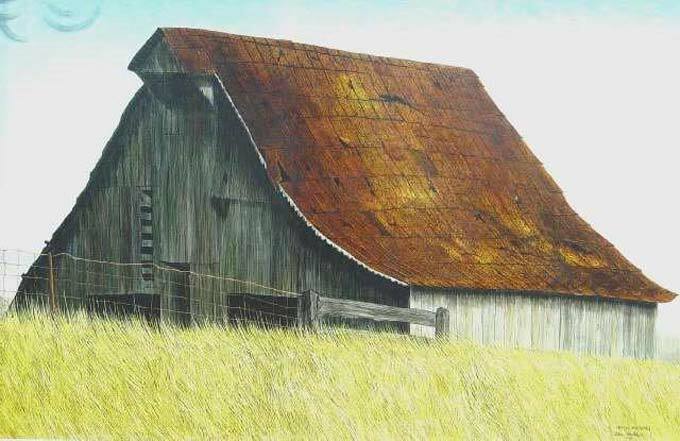 A Barn at Fairbanks | Kappa Kappa Kappa, Inc.
Allen Hackney was an art teacher at Glenn Junior High School in Terre Haute and was born in Madison. He has a B.S. and M.S. degree from Indiana State University and attended Highland Park Jr. College, Highland Park, Michigan. Three years of private study with painter John Laska, who painted Deming Pond in the Tri Kappa collection, was of considerable help to Mr. Hackney. There were small losses along the lower left edge so these were in painted. This is the 22nd painting to be restored.